Morning time. This is the time of day which is most inspiring as it reminds me of a blessing of a new day as the sun helps me unravel from under my fluffy comforter and the promise of coffee coaxes me even more. There is a stillness about the morning, a quietness that often gets lost on the rest of the day. A moment where a cup of coffee is enjoyed, reflections are pinned in a journal, and the only sound that is allowed to disturb the calm of the house, is the sizzle of batter hitting a piping hot cast-iron skillet, which acts as the sweetest alarm to anyone else still dreaming. Lazy bones gather at the kitchen table, as griddlecakes are rapidly drowned in syrup and butter and disappear within mere seconds. And in the one moment of pure bliss and contentment, breathe deeply and know it will be a good day. It’s already a good morning. Whisk egg, buttermilk, and honey in a small bowl. Whisk the cornmeal, flour, baking powder, baking soda, and salt in a large bowl. Whisk the buttermilk mixture into the dry ingredients, then whisk in the butter until there are no lumps in the batter. MmMm, the subtle bite in the griddle cake was delish! And the flavor wasn’t as muted as I thought it would be, it just replaced it with a nice cornbread taste! Which still fit with my syrup of choice:butter maple yo! All in all, 100 stars! Golden ones! Thanks! I’m so glad you loved them! I agree, they are amazing! These are scrumptious! Impossible to have a bad morning after these griddle cakes! These look like the ideal country breakfast pancakes. 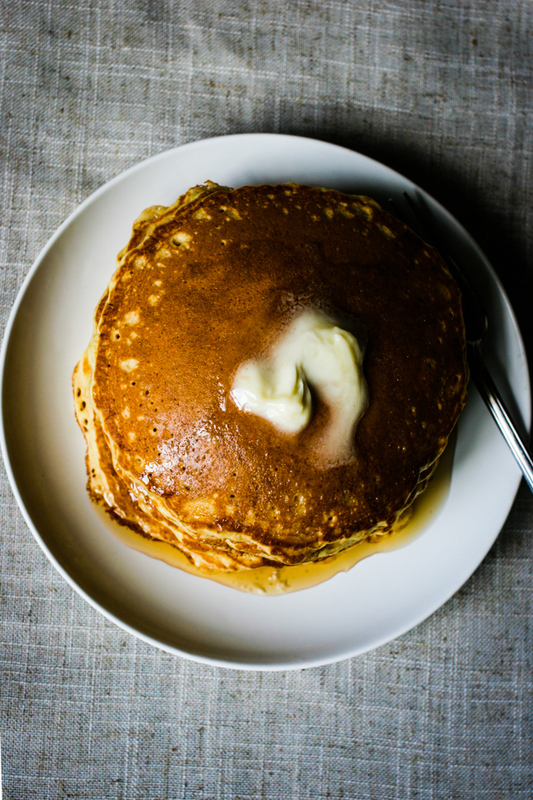 A hot stack, dripping with butter and syrup and choc full of buttermilk and cornmeal. Syrup on top, coffee on the side? Heaven. Absolute heaven.